Sinkholes refer to a deep hole in the earth’s surface due to various causes . Most of these are a result of human activities such as mining and drilling , while others are natural phenomenons . They may appear to you to be like a meteorite crash site , a crashed UFO site or a gateway straight to hell . Whatever their cause might be , they do look incredibly frightening and can bring chills down your spine. In this list , we take a look at some of the most astonishing sinkholes to have appeared around the world over the years. 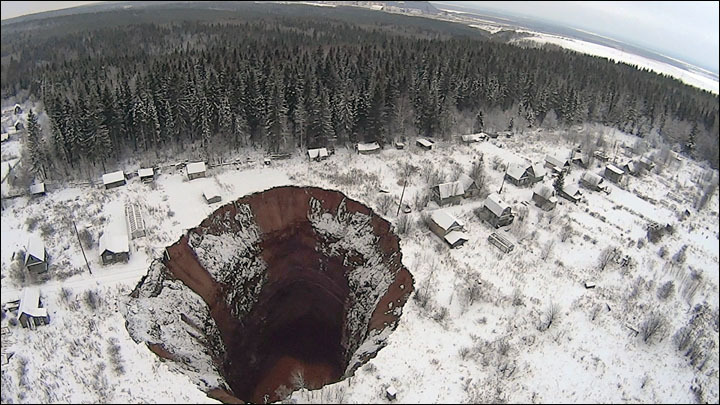 A giant sinkhole has emerged on the site of a collapsing mine in western Russia causing widespread panic in the hearts of the nearby residents. It is located in the Solikamsk-2 mine , which suffered a complete damage from an underground flooding in November , around the same time when the sinkhole appeared for the first time . Expanding it’s dimensions from 20 by 30 meters to 122 by 125 meters in a period of just nine month , has created a sense of panic in the town’s residents who fear for the safety of their family and their homes . The mine’s owners, Uralkali , the leading potash producer in the world has assured the residents to compensate any loss of property due to the expansion. According to the company , the major reason for the current plight of the mine is the 1995 earthquake which was accompanied by a flood that weakened the bedrock structure by making it unstable. Famous for its high salinity and lowest elevation of earth , the dead sea that people had known before is now rapidly shrinking. And along with a decreasing sea level , dangerous sinkholes can be seen surfacing on the ground . The sinkholes were first observed in the 70’s , but have been rapidly increasing in the past few years . These sinkholes pose a threat to the locals and the tourists alike . Though there has not been any reports of any life lost by now , still the issue should be taken seriously . The largest one in the area is 40 meters wide and 25 meters deep. 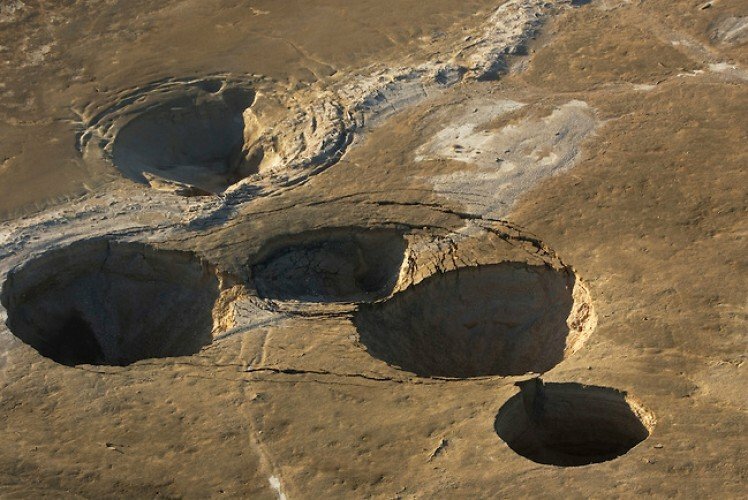 Experts fear that if the sinkhole formation continues at this pace , these scattered sinkholes may combine into One massive sinkhole threatening the existence of the once considered ” wonder of the world “.